to find the perfect Mexican village. Why? Cause I think about it every single day. And sometimes, you just gotta go with the ongoing thought process. It will be a trip that happens later in the year, but an epic one. Done by truck, with dog in tow. Somewhere on the Pacific coast is the tiny village that haunts my mind. The places that come to mind are already too saturated...probably because I know about them so well. I'm not saying I wont revisit them and give them a go, but I feel like the PERFECT place is one that I've not been to yet. It would have the vibe of San Pancho (maybe it is San Pancho), a bit of the arts like San Miguel de Allende, the walkability of Yelapa, totally drivable from the USA and not on the expensive side like Isla Mujeres. I dig the island flavor of Isla Mujeres but I'm not feeling the Caribbean these days, and Isla Holbox - though cute - just seems so far away. Maybe once I'm further down - Puerto Angel area - maybe things will start to click again. But I think it's literally a border cross and a mosey all the way down the Pac side for a few months. Why not? I just went to Baja this past weekend for a weekend long Spanish class and I think I've quite possibly been handed the golden key to understanding how to finally master this language. Can you imagine if that's the case? I've got to start planning it all now - but again, most likely, this wee spot on earth is a place I will happen upon randomly - like most good things...obvi, food is a priority - there must be super fresh seafood and warm balmy waters. The ocean must be swimmable (unlike most of Todos Santos); it would be super if I could ride my bike most places; dog-friendly is a must; margs must always be on the happs; and it's got to have a tight-knit (but not unbreakable) community feel for things. Dang, if you go back all these years to my first Toothie posts, I was looking for the same thing way, way back then. Unreal...my soul has never stopped searching for a place to land south of the border. With Mexico being the norm. See, here's the thing. Look how happy these pictures of Casa de Mita in Mexico make us. Compared to the doldrums and horror of the snow and sludge and cold of winter in most of America at this moment. I was just there at de Mita last month for my b-day (a big fat treat to myself) and listen, to me...there is pretty much no place on earth right now that rivals this magical little haven. I have been multiple times, but this time - yet again - solidified that I not only am looking for a guarantee of happiness in my travels, but I'm also really super jazzed about being taken care of while out there. Lalo and Memo are sent from above as far as their social skills, drink making skills, and humorous attitude day & night. Really, everyone there is a spectacular artform in their ability to make me feel at right at home and very far away all at the same time. I can practice my Spanish, I can walk the beach 24/7, I can eat incredible food, I can read book after book, I can work the killer tan, and I can play with the doggies while missing Minka - (I have a heartwrenching tale I will share sometime about their newest pup Madison some day, but I'm still too tender over it all to go into it - however, she is a rock start and doing great)! Thw owner, Marc, has created the perfect paradise in my fave place on earth (well, it ties with Indo) and I simply cannot wait to get back. Again, the cold is here in these dark mountains and Mexico tends to be a place in my soul where the sun always shines, the smiles always burst, and the drinks are always frosty cold. Bless you, Casa de Mita. Here is the latest article for Baja Bound - guess I loved writing in Minka's voice! As a dog, there are a couple of things I will always know to be true when I hop in the truck with my mom and dad. There will always be a big adventure when we finally stop. There will always be lots of new friends to kiss. And, there will certainly always be blissful bits of road scraps to be wolfed down. My folks like to eat like kings and most times, I just follow their bellies, knowing that if I’m a real good girl, I’m gonna see and taste all sorts of new delicious things. Little did I know what was in store for me on my first few trips to Baja (grilled fish, creamy avocado, bones galore, big chunks of machaca) but I’m now an old pro at border crossings (four times in less than a year!). However, in the beginning of my puppy days – whew, what a whirlwind! 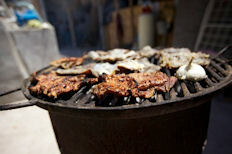 My first mega trip across the border into Baja (December 2012) involved all sorts of preparation. We visited my vet to get travel paperwork, we set up the back seat of the truck with lots of soft blankets (I actually called shot gun most of the trip), and we hit the pet food store so I could select a new toy (Mrs. Squirrel, whom I happily unstuffed just outside of Santa Rosalia). We made it across the border and lots of military checkpoints and nobody ever questioned me, or my wagging tail. I know my folks were nervous about finding hotels that were dog friendly along Highway 1, especially with limited internet access to do research on the way, but my mom is a smartie – she used the website vrbo.com (vacation rentals by owners) for most of the trip and when we got into no mans land she’d just perkily enter a hotel (with me) to see if pets were allowed and once they saw my super cute face and cheery smile, they always said yes. I always noodle my whole body around peoples legs to make them comfy and usually they give me a little treat or at the very least a good scratch behind the ears. I’m a really big fan of the nice cool rooms at La Mision Hotel in Loreto. We always get bay scallop risotto there and so many new friends pet me in the lobby every day. The life in Loreto is just my speed – chilling in the town square while my mom sips a mango margarita and I touch noses with all the dogs off leash running around. They usually want me to come with them on their scouts through the village, but I know the best place in the world to be is right at the base of my mom and dads feet. Ever had nibbles of the scrambled egg and cheese burrito from Café Ole just off the square? Wow. Now as for food along the way, the perk of being a road dog is the quantity of good girl treats I get. My mom always takes me to the funnest restaurants – all with outdoor seating, so I’m always invited. Tiny shacks on the beach where I get to jump in the water, practice my fetch skills and eat lots of grilled shrimp and fresh fish. One of my best Baja friends is a really pretty girl named Pele down on the beach in Bahia Concepcion – her parents run Ana’s Restaurant on Playa Santispac. We ran on the beach until we were delirious, but you gotta watch out cause those little pangas have anchor lines to shore that will clothesline dogs like me if you aren’t careful. Pele and me witnessed that travesty firsthand. "Just south of Ensenada is La Bufadora, the world’s 2nd largest blowhole. It’s interesting to see it shoot 100 ft. into a cloudless sky, but what’s more enthralling is what’s tucked behind the bar at La Bufadora Tequila Grill, just up the hill from the blowhole. Literally – the best tequila you will ever taste. You’ve never sipped tequila like this before. Yes, you sip it. And ever so slowly. The recipe for this vanilla pod, herb tangled, orange peel, raisin infused thrill ride runs back triple generations and is like nothing else you’ve ever let tickle your tonsils. You can take in a few rounds onsite while watching the sun set over the Pacific or even better buy a bottle to go ($100 per) and you will be the kingpin among all the dis-believers when you bust it out at your next dinner party. This is a handcrafted batch of Gods’ tears and rumor has it that it’s good enough for Tiger Woods to chopper over for (he’s building a golf course nearby), consider it next level sippin’." There is also one of my fave spots on earth – San Javier. Turns out this little village in the mountains above Loreto, is full of dogs. Only 140 people live there and there are at least 20 dogs running around! Oh, the joy. I’ve never played with a friendlier pack of pups in all my days. Little ones, big ones, sassy ones, and one real funny one who had a beer can tied to his tail. Guess everyone wanted to know when he was coming down the boulevard! Mom likes to drink skinny margaritas at the little café on the square and just recently we got an amazing tour of the huge farm behind the church. One of the oldest families in San Javier owns it and they have lots of old grape vines to make wine from and olives for fresh pressed olive oil. I can’t wait to go back for the harvest this fall. I’m definitely planning on a personal tour with Memo again. 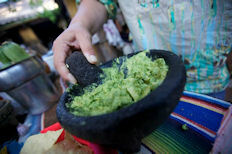 He’s the handsome cowboy that makes the homemade machaca I love so much at Palapa San Javier. He’s famous for it and was even in a book! Anyhow – this roundup barely touches the life I lead down in Baja. Like my mom and dad, I dream of it often. But, as I say to the border guard at the Tecate crossing (we always use this one cause it’s shorter lines and a prettier drive) – Woof! Woof! And catch ya on the rebound! He just tosses me a smile and waves us right through. Pack your pet's travel paperwork with you just in case. Let the hotel desk clerk meet the dog right away before they jump to conclusions. 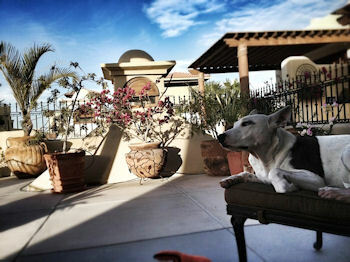 Check out Baja Bound's Pet Friendly Hotel Guide for hotel ideas in Baja Norte. 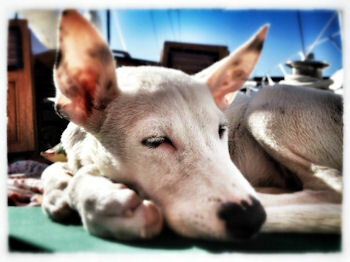 Pack a chilled towel so when the fun is over you can rub your dog down, cleaning and cooling him/her at the same time. It is recommended to give your pet bottled water. Let your dog play with the local dogs – just keep yours on leash. 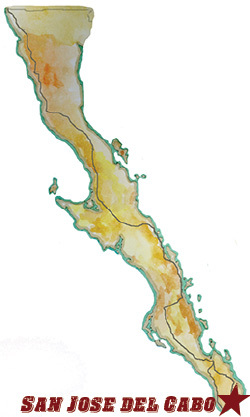 Bring an extra harness and leash in case for some reason yours snaps in the middle of Baja. Coconut oil soothes hot, sore paws from long walks in the heat. 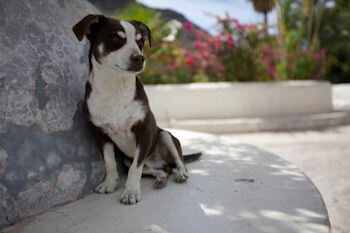 All restaurants are dog friendly if there is outdoor seating – and that’s what Mexico is all about.